Picking an engagement ring that you’ll love til death do you part can be tricky. But with a few tips like these, you can easily find the ring of your dreams. Over 2 million couples tie the knot each year in the United States. For most people, finding that special someone and settling down is something they dream about. Once you are sure that you have found your soulmate, you need to plan out an elaborate and special proposal when asking for their hand in marriage. One of the most important parts of an engagement proposal is having the right ring. If you have never proposed to someone before, you may be surprised to learn how many different wedding rings there are on the market. The key to picking an engagement ring is taking the time to weigh all of your options. Rushing through this important decision will lead to a number of mistakes being made. The last thing you want to do is taint the memory of your engagement with an unsightly or cheap ring. 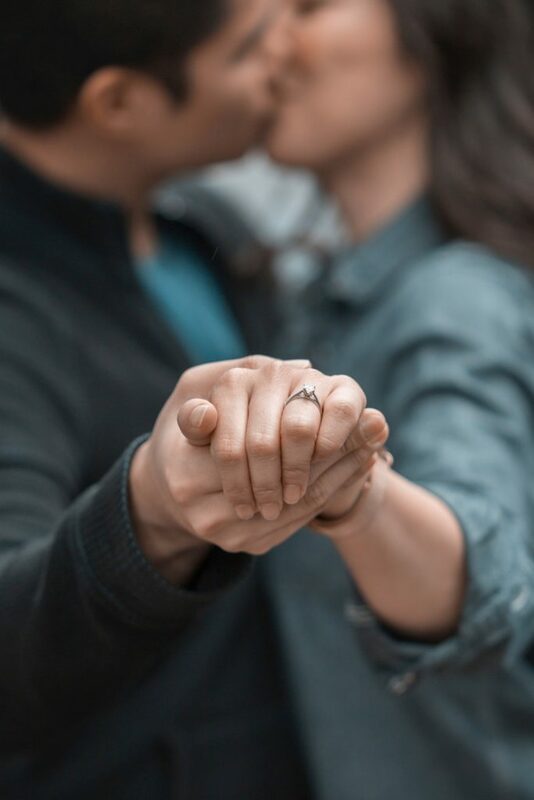 If you are in the process of trying to choose the right engagement ring, be sure to consider the following tips for success. Before embarking on your journey to find the right engagement ring, you need to do a bit of research. One of the main things you need to familiarize yourself with are the 4 Cs of diamond ring purchasing. The first C you need to know about is the color of the diamond. The less color a diamond has, the more it will ultimately cost you. The cut of the diamond is also an important consideration to make. The next C you need to learn about is the diamond’s clarity. The last C is the carat weight of the diamond, which dictates the overall value it has. By applying the 4 Cs to your diamond ring buying process, you can get the best ring on the market with ease. You may be surprised to learn just how many diamond cuts are on the market. Shaping a diamond takes a lot of time and effort, which is why oddly shaped stones are so valuable. Before going out to look for a ring for that special someone, you need to get a feel for the type of cut they may like. If your love is entranced with larger and more pronounced stones, then getting a princess cut diamond may be a good idea. When looking at the various diamond rings offered by a jeweler, be sure to pay attention to the overall quality of the cut. You want to make sure there are no drastic imperfections in the stone due to cutting mistakes. Educating yourself on what to look for in engagement rings is essential before spending your hard-earned money on one. Having details on exactly what you are looking for in an engagement ring is essential before starting the buying process. You will need to detail everything about the ring you want, especially the type of metal you want to use for the band. Some of the most popular metals used for these rings are titanium and white gold. If you are looking to save a few dollars on your engagement ring purchase, then choosing white gold as the band metal of choice is a good idea. However, this metal is not nearly as shiny and resilient as titanium. Getting a unique and customized look for your ring is easy if you go with a metal like rose gold or a cobalt-colored alloy. Consulting with a reputable and experienced jeweler can help you during this buying process. With their assistance, you can get a high-quality ring for a fair price. The apparatus that holds the diamond in place on an engagement ring is referred to as the setting. These settings come in a variety of shapes and sizes, which is why you need to do some research before choosing one. A setting is designed to both highlight the beauty of the diamond on your ring and protect it from damage. One of the most popular types of engagement ring settings on the market is the prong. Generally, this setting will feature four to six prongs, which are essentially narrow metal supports. Often times, this setting will be used to support a single stone. Another popular engagement ring setting is known as the bezel. This type of setting features a thin metal strip that is hammered around the stone to hold it in place. If you are looking for an added layer for protection for your engagement ring, a bezel setting is a great option. Newcomers to the world of engagement rings fail to realize that the sky is the limit when it comes to customizing their jewelry. One of the biggest trends in the world of engagement rings is adding brightly colored side stones. Not only can these stones help increase the vibrancy of a ring, but it can also make it more appealing. Often times, engagement ring buyers will choose diamond baguettes or even colored gems as their side stones. If you are stumped on what colors to use for your side stones, you may want to consider using your soulmates birthstone color. The key to having success with this type of ring customization is finding an experienced jeweler to help you out. A jeweler with experience can bring your vision of the perfect engagement ring to life. When picking an engagement ring, you need to avoid getting in a hurry. Rushing through this selection process may lead to a case of buyer’s remorse. Are you looking for more wedding-related advice? If so, check out our article on weight loss tips designed to get you ready for wedding season.